I have been writing my musings for the past year on the topic of women feeling more and more invisible as they age. I told you, dear readers, in one of my stories, the word invisible was brought to my attention during a meeting of a women's group. Before that day, I never equated a woman or a woman's age with invisibility. Therefore, I was caught off guard when I heard, "I feel invisible because of my age." The other women agreed. I am still, over a year later, bewitched, bothered and bewildered by the word. So are women writers who write about our problem of invisibility relating to age; in books, articles, essays and compositions! The word has gone ballistic. 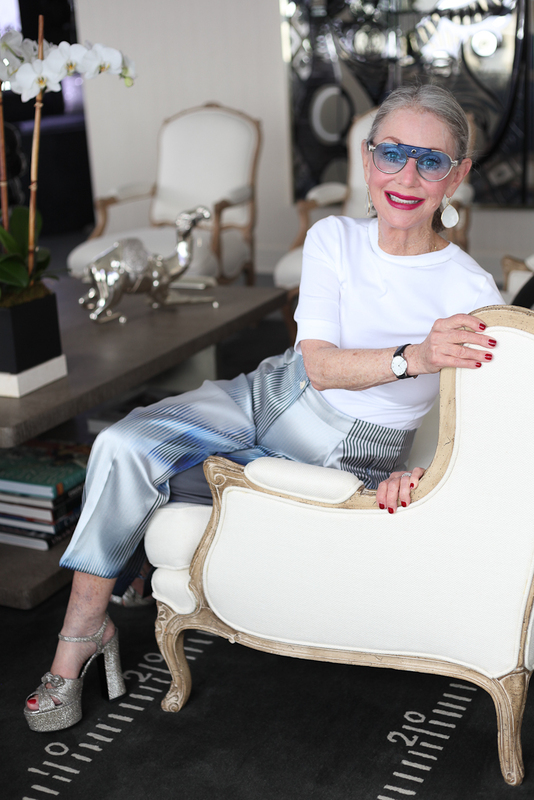 I think there are rational and irrational reasons why stylish women over fifty feel this way. I also believe no one has to live an invisible lifestyle. The day I listened to the responses of the women discussing their feelings, on invisibility, I said out loud to the group, "I think of Casper the Ghost when I think of invisible." I blurted out the sentence because that was my thought. Why? Because I never equated, as I mentioned, the word, invisible, in a human sense. Now after a year of thought, I get it. Some of us feel very invisible. Widowhood, divorce, lack of friends, and boredom as well as empty nester syndrome, retirement, indifference with a spouse and poor health can create the feeling of invisibility. When does this happen? Usually after the age of fifty. So we have a choice dear readers of mine: we can remain invisible Casper the Ghosts or we can, as I always said to my daughters and now to my Grands, in a very upbeat and fast sounding voice, "TRY, TRY, TRY!" And I say this to you who are feeling in a funk, who are in a rut, who are apathetic, think of that little tugboat that said, "I know I can. I know I can." For my own needs, this older woman has no intention of living out her life on the side lines. I am living larger than I ever did, taking risks, constantly learning and as I told one of my girlfriends today, on our almost daily walk, my life is a 9 out of a 10. One of the reasons: I have learned not to marginalize my lifestyle. I have never felt more visible, not to the maddening crowds, but within myself. And that, dear readers, is your key to visibility. It must come from within you. Since society is not rushing to your aid, each of you is responsible for finding a solution that works for you and your unique lifestyle. Dye the grey out of your hair if it bothers you, get rid of your glasses (if you think they are aging) and go out and buy a stylish wardrobe. It is in your hands how you decide to physically present yourself, so be true to yourself. Truthfully, I don't believe that visibility has anything to do with the color of your hair, glasses versus contacts or stylish clothes. But it is a pick me upper, so go and pick yourself up if you are inclined. Aging well is all about your attitude, dear readers of mine. I believe we can all be more visible, vital and relevant in the second halves of our lives. 1. Spend time alone. Keep a journal. Love the quiet of the day. Why? Because it gives you time to explore your feelings. Questions yourself, your motivations and your reactions to your experiences. I am not telling you to become a recluse. I am explaining the importance of taking time to be alone. 2. Take more risks. Stop being stuck in the past. You will feel better moving forward. Delve into something you have wanted to accomplish. 3. No self-pity. Don't allow your past regrets to saddle you to your past. You want to move forward not backward. 4. Seek out relevant friends who learn and evolve. 5. Explore and travel. If you live in the state of Illinois, you can drive to Abraham Lincoln's library. Not costly, but this little trip will prove fruitful. I visited my high school friends in Kankakee by the Sea. We had lunch. I left with new information, happy as could be and will return this summer to reconnect. 6. Desire. Open yourself up to self-awareness and shape your dreams into reality. Your lifestyle will be determined by your attitude. Your visibility will be determined by your relevance. Remember it is your inner thoughts that will provide you with visibility.